Whether by totally transforming a city’s skyline, subverting old standards of hotel architecture or creatively reclaiming historic structures, these 12 unusual modern hotel designs have become destinations in and of themselves. These aren’t just cool-looking concepts that may or may not ever become reality – they’ve actually been built and are open for business. 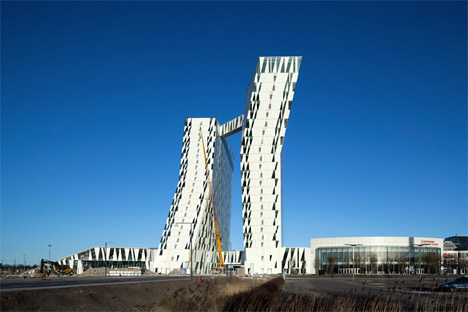 Two wedge-shaped towers connected by a small skybridge taper down to the ground at 3XN’s Bella Sky Hotel, a new landmark in Copenhagen. 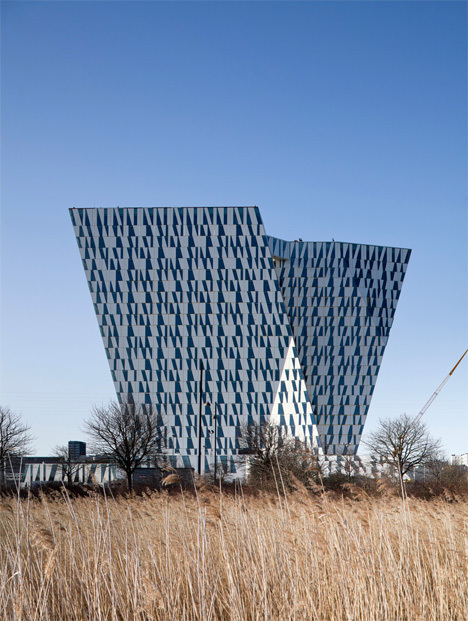 Not only does this unusual design transform the city skyline, it also has the benefit of giving all 814 guest rooms view of the surrounding landscape. 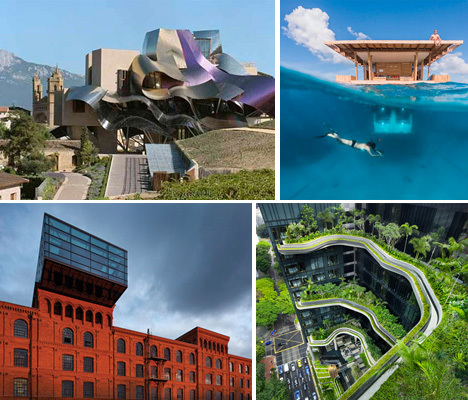 Whether they’re world-class museums or relatively small hotels in the Spanish countryside, architect Frank Gehry’s designs are anything but ordinary. 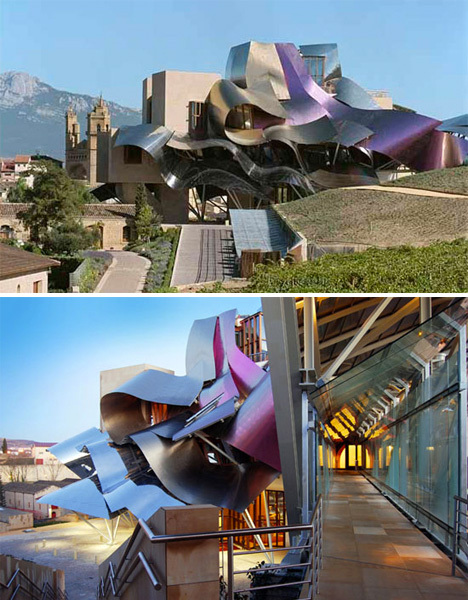 The City of Wine complex for the Marques de Riscal Winery in Elciego, northern Spain features a wavy metallic exterior meant to reflect the colors of the winery’s signature bottles with their silver foil and gold mesh covering. The building houses a five-star, 43-room hotel as well as a restaurant, a spa offering ‘wine therapy,’ a wine shop and a viticulture museum. 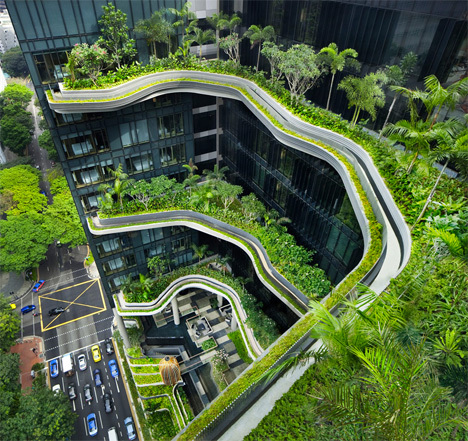 Terrace after terrace of vivid greenery characterizes WOHA’s Parkroyal Hotel in central Singapore. 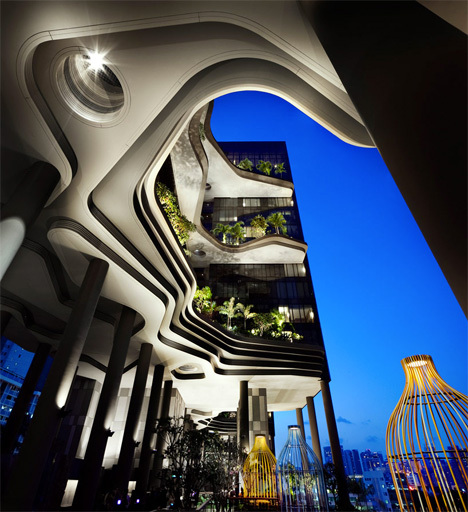 A series of towers is elevated above a wavy, sculptural ground-level platform characterized by breezy courtyards that blur the boundaries between indoor and outdoor spaces. A cantilevered dining hall reaches out over the rocky coastline of Fogo Island, Newfoundland in Canada. 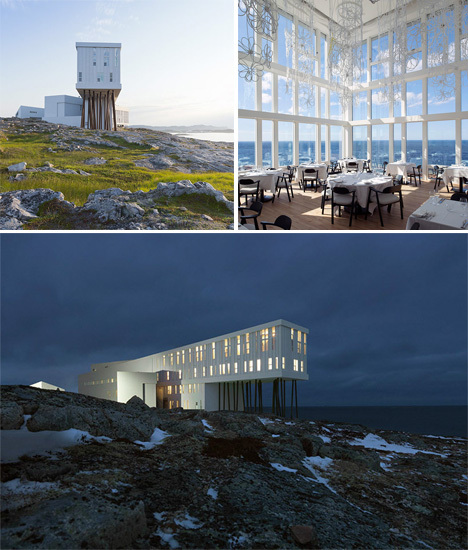 The Fogo Island Inn, by Saunders Architecture and the Shorefast Foundation, is a contemporary 29-room hotel merging traditional craftsmanship with modern aesthetics for a dramatic look that pays proper tribute to the landscape.